If you have been missing your Udderbelly London, an upside-down purple cow, your wait ends here since it’s all set to revisit to graze in London on the South Bank area. 2015 will be an ox-cellent seventh year for udderBELLY. The event will be unveiling some of the wonderful Circus, Music and comedy shows along with the variety of stunning novelty acts of different manners. 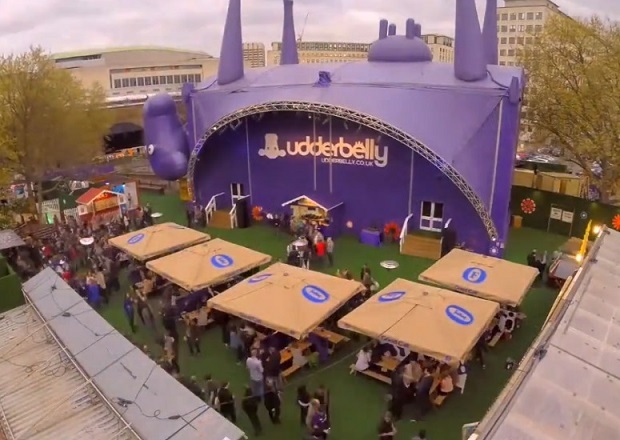 As discussed above, Udderbelly is referred to an upside-down giant purple cow tent which is owned by a reputed management and event venue troupe, fondly called as udderBELLY and originally subsidised by E4. The reason why udderbelly is appreciable is its spacious ability which can easily be treated as the stage or a full-seater with the whopping seat venue of 405 guests. Majorly it’s a kind of giant tent which is given the shape of an upside-down cow. It’s built up with strong aluminium tether casing which makes it so sturdier that it can potentially contain a tonnes of weight. What about Udderbelly London Festival 2015? Every year, Udderbelly London, the large 405-seat or a giant purple cow provides its lovers with the huge spectrum of entertainment which range from the spectacular children shows to the peculiar cabaret, electrifying dance performances to roll-on-the-floor comedy shows and more. Moreover, apart from these paid performances, for the people who just want to roam around without a ticket, there is also a vast fleet of exclusive food stalls which one can enjoy. Moreover, those who want to enjoy something more dramatic can switch to London Wonderground, a colossal Spiegel tent which is hosting oodles of cabaret, circus and more. So what else could be a better way to enjoy summer? The festival continues from April 8-July 19 2015 and there would be a large number of things to get pleasure from. Just spare some time from your busy schedule and get enrolled into the giggling activities which are sure to make you roll on the floor with laughter. Let’s buy your tickets now!